For the beginning (or even experienced) cyclist, making your own bike repairs can seem like a daunting task. Most bike repair guides you'll find around the ol' internet can be complicated labyrinths of instruction that end up doing more harm than good. But taking your wheels to a pro can come with a major price tag. Bike Doctor wants to give you the knowledge you need to save a trip to the shop—but in an easy, digestible form that's useful to all walks of the bicycle world. Gives you 42 guides for 42 common problems avid bike riders will come across. Everything from wheel punctures and squealing breaks to more advanced stuff like bleeding disk brakes gets the step-by-step treatment. There's also a set of preventative guides to make sure that you're giving your bike the necessary checkups and keeping it in tip-top shape. The actual app was created by Andreas Kambanis, the founder of London bicycle blog londoncyclist.co.uk—so he knows what he's talking about. Plus, every instruction set has been explicitly tested on beginners to make sure that these repairs are approachable enough for anyone to handle. 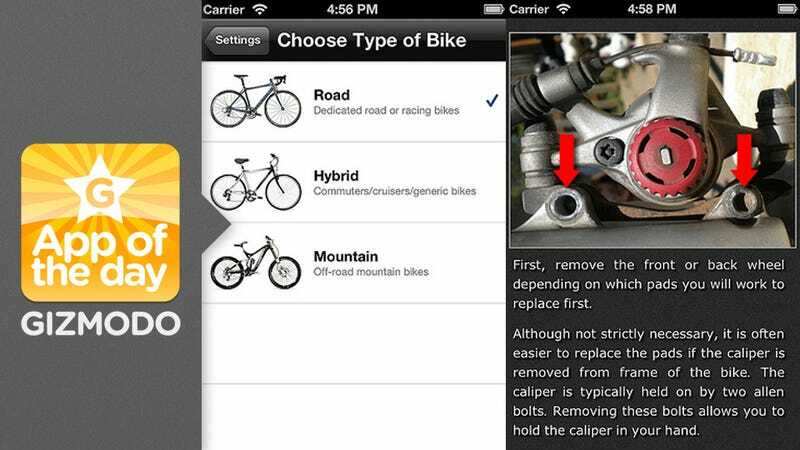 If you ride your bike with any frequency, this app is invaluable in the money it could potentially save you in costly bike repairs that you could just as easily do yourself. Plus, the app's newest incarnation runs on iPad, giving you an even clearer view every step along the way.